August 8, 2016 (The New Atlas) - Thais took to the polls yesterday voting overwhelmingly in favour of a new national charter organised under the military-led interim government. The interim government has attempted to restore peace and stability to the country since coming to power in 2014. Prior to 2014, Thailand has suffered nearly a decade of unprecedented political corruption, conflict, violence and instability under the influence of former-Prime Minister Thaksin Shinawatra and his political party, Pheu Thai. The new charter aims to further restrict the abuse of power possible under previous frameworks by introducing a more rigid system of checks and balances between elected and appointed members of government. 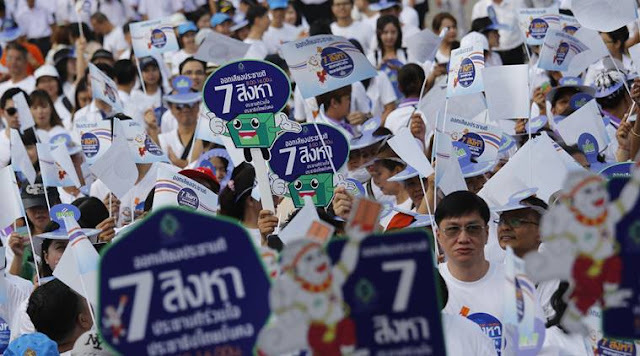 Voter turnout reached nearly 60% and despite attempts by Shinawatra supporters and the Western media to question the legitimacy of the vote citing "low voter turnout," it should be noted that the percentage of eligible voters to vote "yes" on the referendum matched closely to those in 2011 who voted for Shinawatra's Pheu Thai Party. In 2011, the Western media characterised what was essentially only 35% of eligible voters backing Shinawatra's party, as a "landslide victory." A possible explanation as to why the Western media favours Thaksin Shinawatra and has exhibited double standards in its reporting on Thailand, lies in the fact that Shinawatra had for years eagerly served US-European interests while in power. Today, Shinawatra exists as a convicted criminal living in self-exile to evade a two-year prison term and a raft of pending criminal charges, according to the London Guardian. 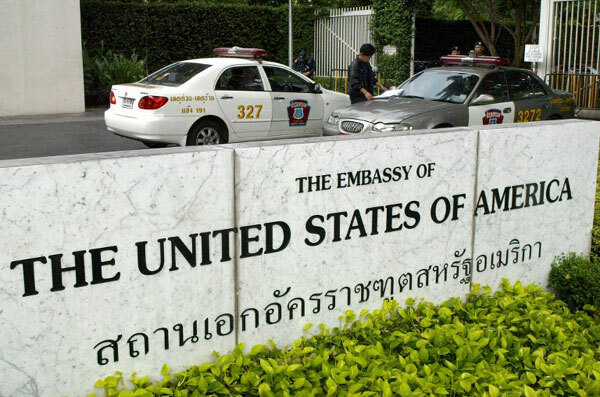 Wikileaks would reveal the US Embassy in Bangkok depicting Shinawatra as a stalwart ally of both Washington and Wall Street who genuinely believed he had a "special relationship" with America's political establishment. You [Zoellick] are visiting at an opportune point in our negotiations with the Thai on a Free Trade Agreement (FTA). With Prime Minister Thaksin Shinawatra no longer distracted by elections and firmly back in power for four more years, your meeting with him offers the best opportunity to move forward on an agreement that will benefit both countries, and could stand as one of his finest legacies to Thailand. Thaksin characterizes himself as a "CEO Prime Minister" and portrays himself as a decisive leader. Critics, with some justification, accuse him of stifling dissent within his government and filling key government positions with family members or classmates. Following several meetings in Washington and the very successful October 2003 Bangkok APEC Summit, Thaksin believes that he enjoys a special relationship with the President. It should be noted that previous negotiations for the unpopular and ultimately failed US-Thai Free Trade Agreement in 2004 were marked by Shinawatra's attempts to pass the deal without parliamentary approval, indicating the level of unilateral authoritarianism with which Shinawatra attempted to fulfil the wishes of Washington. The cable also enumerates Shinwatra's support for America's invasion and occupation of Iraq in 2003, which included a commitment of Thai troops. Additionally, US cables would essentially admit to Shinawatra's use of terrorism against his political opponents before the 2006 coup that ousted him from office, and despite this, the US still (to this day) repeatedly has expressed interest in returning Shinawatra to power. The US Embassy would then proceed to enumerate and describe 5 separate incidents. That the US still provides political support to Thaksin Shinwatra, his political party and a growing army of US-funded NGOs inside of Thailand supporting his bid to return to power despite admissions that he has restored to terrorism as a political tool is at odds with what the US itself calls "international norms." With this in mind, the active steps taken by the current Thai government to prevent such a political movement from returning to power seems both rational and justified. It's disappointing, however, that there have been some inappropriate intervention by foreign elements during these delicate times of our political transition. All [of this interference has] inevitably led us to have contempt for the sentiments of those who claim to be "friends" of Thailand. This malicious intent has been resonated loud and clear in the hearts and minds of the people who have spoken with resolve at the Referendum today. Taylor would attempt to claim that the statement was "surprising" considering what he believed was relatively muted Western criticism. What Taylor apparently doesn't know or is unwilling to admit is that while Western ambassadors craft diplomatically agreeable statements regarding Thailand's political process, their embassies are hard at work funding and directing subversive activities across the country through various nongovernmental organisations (NGOs). These are activities often carried out with the direct cooperation and approval of Western media organisations operating in Thailand, including AFP. Thailand's comments reflect a growing chorus across Southeast Asia of nations increasingly chaffing under US pressure on a wide spectrum of issues ranging from unwanted free trade deals to participation in America's increasingly disruptive conflict with China in the South China Sea. Cambodian Prime Minister Hun Sen also recently criticised American interference in the political affairs of other nations, noting the destabilisation of the Middle East caused by US foreign policy, and alluding to signs of US-backed instability being incited within Cambodia itself. Shinawatra supporters and the Western media are now attempting to find fault in the recent referendum and assign their own rationale as to why voters approved of the charter in a way that fits their narrative. 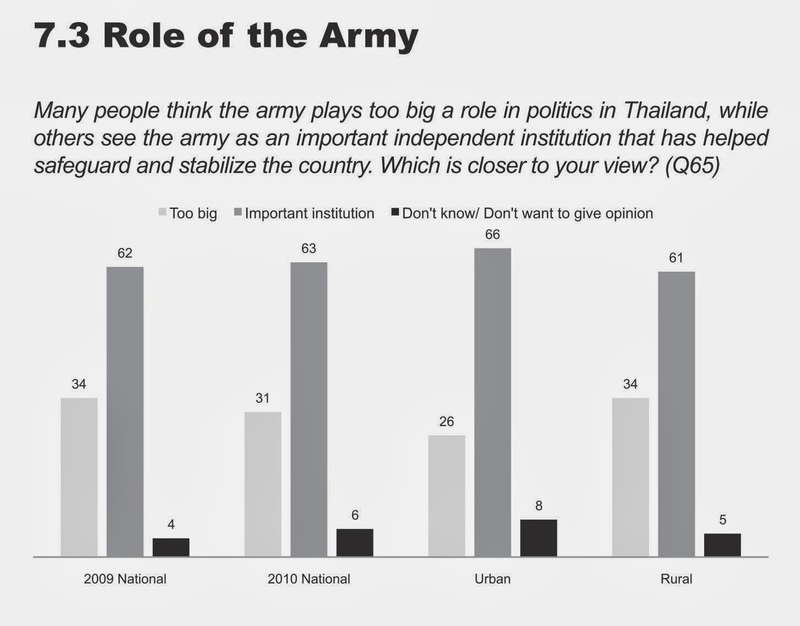 However, it should be noted that the approval of the charter reflects almost exactly the public approval ratings of the Royal Thai Army itself. 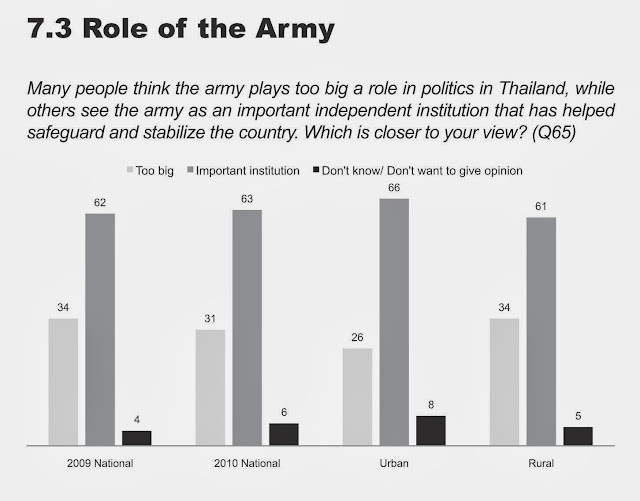 In 2010, the US Asia Foundation (who also observed yesterday's polls) would conduct a survey to assess the realities behind Thailand's alleged "political division" only to find that the Thai military remained a nearly universally popular institution within Thai society, even among some of Shinawatra's own supporters. In both the recent vote and the survey from 2010, support for the referendum and the military exceed 60% respectively. The charter vote, organised by the military-led interim government regarding a document drafted under its administration, represented a clear yes-or-no vote on the legitimacy and merits Thais perceived regarding both the charter and the interim government. 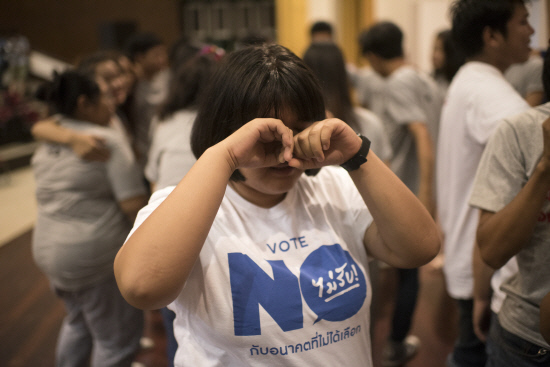 In fact, while Shinwatra's Pheu Thai Party and several of his smaller opposition fronts have now attempted to claim Thais voted "yes" to bring forward elections sooner (implying that Thais eagerly sought to vote them back into power), they had vigorously campaigned for a "no" vote, with agitators taking to the streets wearing shirts that literally read, "Vote No." For the Western media, who has attempted to portray the majority of Thailand opposed to the current government and as supporters of ousted former-Prime Minister Thaksin Shinawatra, the charter vote is yet another indicator of a concerted, biased and intentionally dishonest agenda being couched behind their journalistic credentials. It should be noted that despite favourable elections in 2011 that returned Shinawatra's party to power and the referendum today having similar electoral support, there is a significant fundamental difference that should be taken into consideration. The election in 2011 included campaign promises by Shinawatra offering everything from free computers and cheap loans for new houses and cars, to exorbitant agricultural subsides for rice farmers to entice voters. The referendum, on the other hand, was a very straight forward appraisal of the electorate's support for the charter and the current government, with no campaign promises or financial incentives of any kind hanging in the balance. 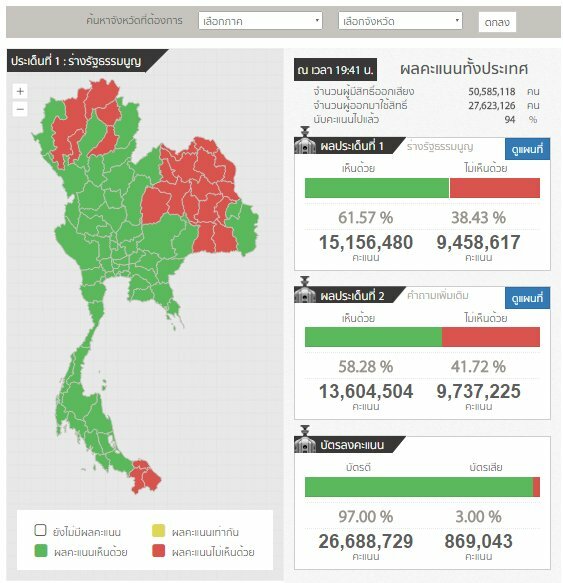 Thus, one could even conclude yesterday's victory at the polls for the interim government's new charter was even more an impressive "landslide" than the Western media claimed Shinawatra's victory was in 2011. The fact that the Western media is not reporting it as such reveals the politically-motivated agenda that guides each word they put to print.